Happy Chinese New Year. Please go to sleep now, no more fireworks – we have an early flight. Lots of love, Matt and Phil. Day two of intense sight seeing in KL. This morning we visited Merdeka Square (Independence Square) where they lowered the Union Jack in 1957 at the end of colonialism. This place is interesting, yet not as intense as other experiences we’ve had in our time here in KL. One side of the square is lined with Tudor style buildings, while the other side is lined with Islamic inspired architecture with beautiful copper domes. 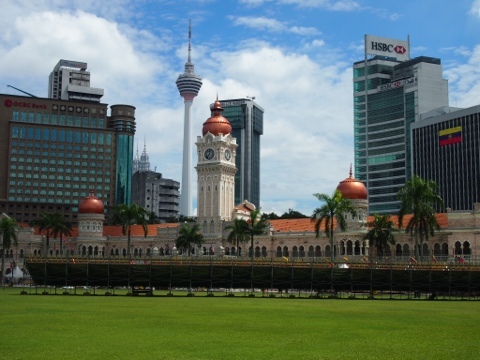 A very large Malaysian flag flies in the square a symbol of national pride. We walked from there to Central Market (see Matt’s earlier posts about activities there), then onto Chinatown for a second time. 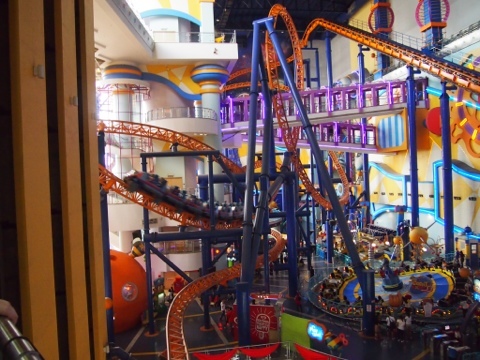 We then ventured to Time Square a massive mall, where we were awestruck by the massive indoor roller coaster. Matt couldn’t find any takers to join him. Then we spent an hour at an IT mall before the monsoonal rain began. It bucketted down from the heavens for about 2 hours. So what was there to do but more shopping. Time for a massage before bed, then up at 5am (not taking any chances, too many stories of almost missed flights in KL) to catch our flight to India. No sir, I don’t like it. People are meant to eat fish, not the other way around.